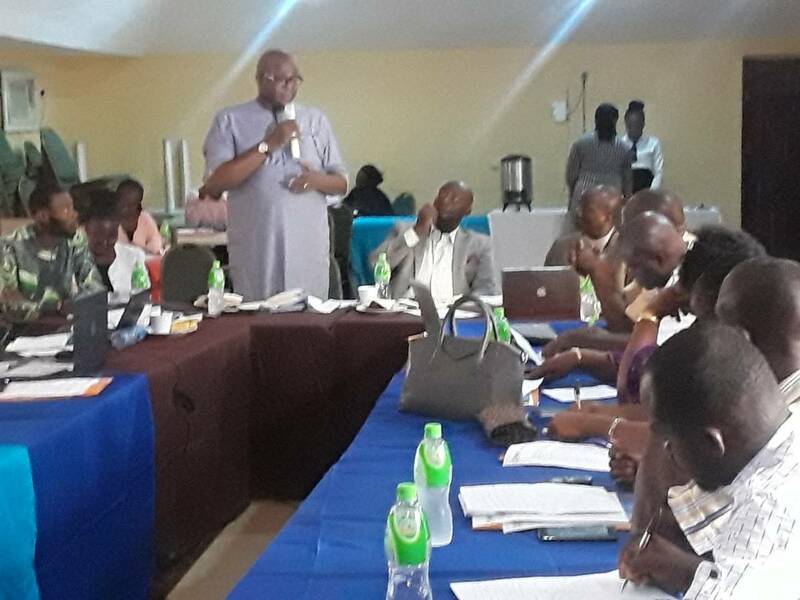 A one-day validation workshop with NDDC officials on the draft Independent CSOs project monitoring report was facilitated by ANEEJ/LITE-Africa at the Dannic Hotel in Port Harcourt, May 15, 2018. 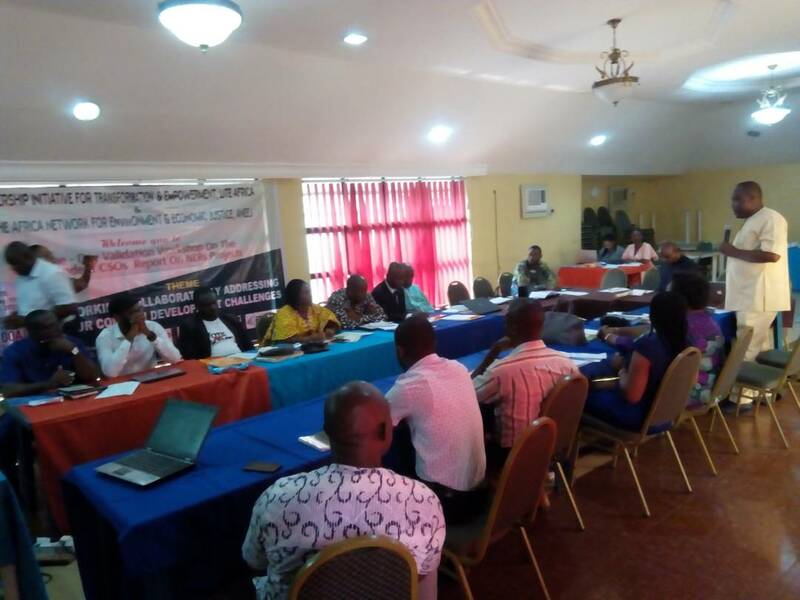 Present at the workshop were the CSOs Coalition members, NDDC officials, SACE, CSOs and Media, making a total of 30 participants. 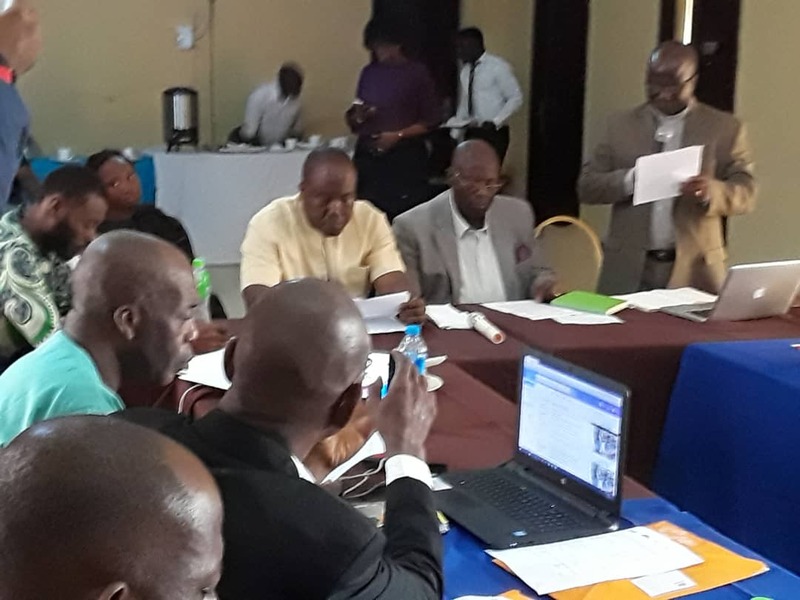 The NDDC officials present at the meeting were Okarevu Davies, Asst Director; Princewill E., Director of Special Duties (Worked office); Mr. Patterson Ogon, Program Manager, Directorate of Research, planning and Statistics; and John Akpan, Technical Adviser to NDDC MD. To get NDDC feedback on the draft project Monitoring report of the Independent CSOs coalition committee. To present the draft Independent CSOs project monitoring to NDDC officials for validation. The Rev David Ugolor Executive Director of ANEEJ presented the joint welcome address (Joint Welcome Address ANEEJ LITE). He also facilitated the feedback session from the coalition members on the status of the projects assessed and their engagement with the PADECS in the state. During the process, he emphasized the need for the Coalition members can use the report for engagement in their states and create awareness through TV/Radio stations. While welcoming the NDDC officials, he stated that the report was sent to the Office of the Vice President which had then assigned an officer to work with CSOs in the region. He said that this was not to undermine the NDDC but to strengthen policy advocacy. Hon. Joel Bisina, LITE-Africa executive director gave an opening remarks as well. He commended SACE and CSOs for the effort in the report and the validation workshop. He spoke on the role collaboration and collective action play as tools for engagement. According to Hon Bisina, the project monitoring report is not an issue of naming and shaming but is for a deepening engagement with the NDIs. 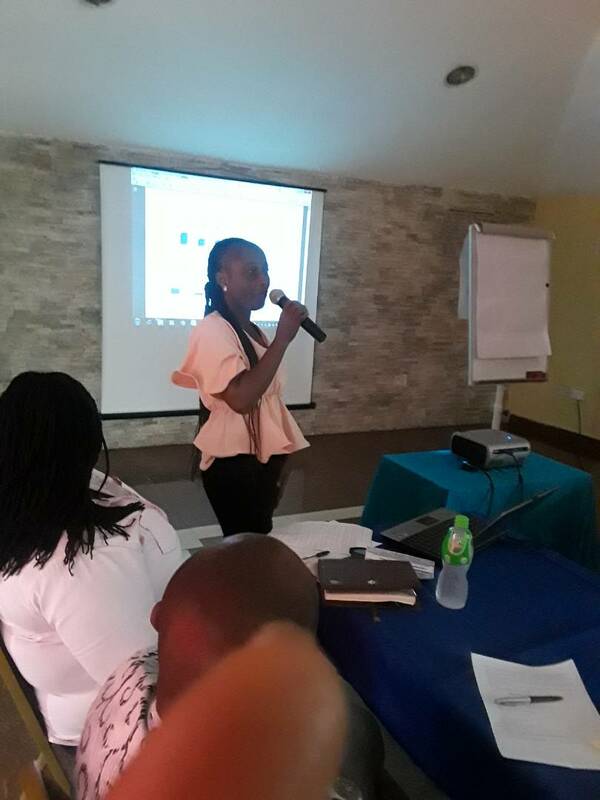 Sandra Eguagie, ANEEJ program officer, gave a summary of the report in terms of the number of projects monitored and status of the projects with regards to completion, non-completion and on–going projects in the nine states. Discussions centering around the report proper was facilitated by Hon. Joel of LITE Africa. Monica Emosairue, SACE Senior Niger Delta Advisor also made an opening remark on behalf of SACE. According to Mrs Emosairue, the validation workshop should be seen as an effort to promote, support and strengthen institutions in the Niger Delta. She said SACE hopes that the outcome of the meeting would bring about change, better service delivery, transparency, accountability and good governance for the Niger Delta. Dr Princewill, Director of Special Duties of the NDDC commended the CSO coalition for their effort directed towards good governance and improving the lives of the people of the region. He noted that more than 80% of the projects captured in the report were implemented by NDDC. He promised to present the issues to the management and project monitoring department and the directors and send the feedback to the CSOs. Davies Okarevu, Asst Director of NDDC said that the 2018 work plan of NDDC is to engage CSOs across the Niger Delta region for project monitoring. According to Okarevu, the NDDC is planning to organize CSO meeting in all the nine states to be able to get regular feedback. He made a clarification to the extent that the NDDC has stopped paying mobilization since 2015 and said no money has been spent for projects not executed. He also stated that the NDDC regularly carries out a needs assessment of all their projects before implementation. He promised that the NDDC will respond to the draft report presented by ANEEJ & LITE-Africa. 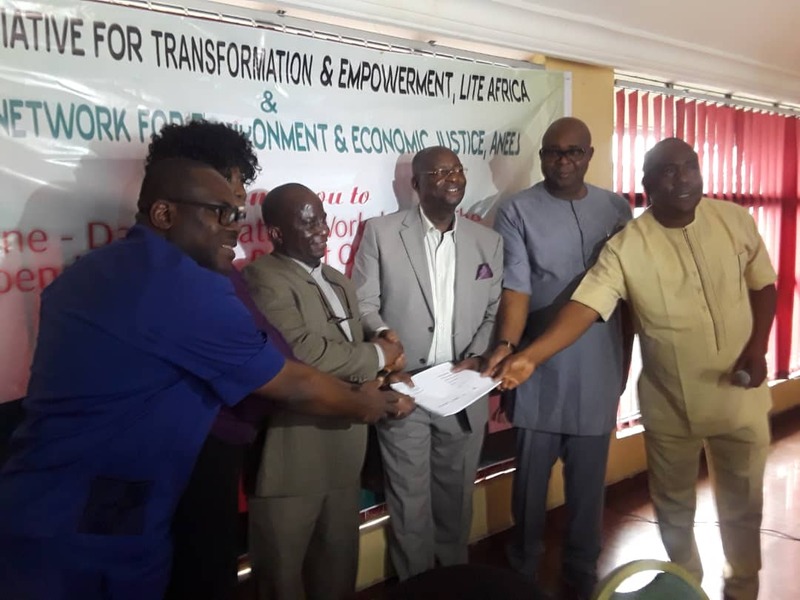 The Validation process came up with a White Paper COMMUNIQUE OF VALIDATION WORKSHOP and the key commitment made by the NDDC was that it was going to explore the avenue of a comprehensive consultation process with CSOs within one month post the Validation Process.